This started off with a fairly innocuous email from a member of the Nastar forum. From Biowolf: Thanks a lot for the effort. I am gonna buy the book for sure. In the meantime I stay confused. In the diagram (Figure 1) the skier turns right and the waist turns right. On the steeps, I assume the skier is setting up for a right turn as well. His waist turns to the left and after a pause keep turning left ? If this is getting too much for you, just ignore the post. Hopefully there will be lots of pictures in the book. A CD would be great. Too bad I have to wait an other year before winning the worlds. Analyzing any racer’s ski technique from a single photo is folly. We can certainly draw some conclusions about what has happened before the picture and what is likely to happen right after the picture but without the full turn, making any sense of what we are seeing is very, very difficult to do with great accuracy. In this article I am going to try and give you all some skills in recognizing what is happening a single picture so you can draw your own conclusion about what the skier has done and is about to do. The ability to visualize the entire turn from a picture representing 1/1000th of a second will develop one of your most important skills for learning - visualization. In the MSRT, Recreational Racing to Win we hope to use a combination of illustrations, stills and photo montages to get each skill, exercise and technique across. As you can see in this illustration (Figure 1), you can visualize how the vectors of the skier affect the turn and how the vectors of the turn may affect the skier. 4) Total body awareness (the most advanced skill). While this makes teaching a race turn easier to understand, the truth is that there are many phases/component motor skills of each turn and we pass through those phases quite quickly to affect the best turn. The combination and sequence of how the component motor skills are applied is what makes one skier faster than the other. So let’s look at some pictures. I will start with one of Wolf’s favorites (and mine), Thomas Grandi. He is an OLD dude from Canada and skis on the best GS skis in the world, Rossignol (there is no question about that from those “in the know”). This is a picture for the 2002 Olympics during the Slalom at Deer Valley. 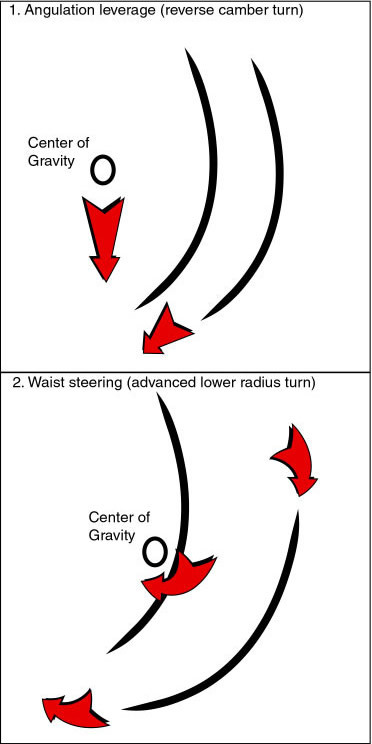 As the principles of waist steering are basically the same in GS and Slalom I’ll use both disciplines in my examples. At this time Thomas wasn’t even on the radar screen but here he is in the Olympics running both Slalom and GS for “Oh Cannnadaaaa”. In the picture above you can see the vestiges of the Old School WC technique (remember, this is only 2 years ago). In this Slalom turn you can see that Thomas has his feet relatively close together and has probably taken the gate with both shins close to the top of his boot line (running very straight with major forces at the END of the turn). Let’s concentrate on his outside shoulder and the apparent direction of his torso or waist. In this picture he is actually reaching across his body with his outside hand to get ready for the upcoming pole plant, which has pulled his outside, shoulder forward. From the bottom right of his right rib cage, however, you can clearly see a bias towards the new turn (already). Though his hips are still “square” the old turn you can see that from this position he cannot get sufficient (IMHO) weight onto his uphill ski to transition off this ski. In other words, due to the lack of waist steering deep enoug! h into the turn he will have to rely on a twist of his upper body to get his hips up and through (rather than waist steering) and does not have the leverage of a well edged and weighted uphill ski to make an earlier and more dynamic transition thereby relieving the forces later in the next turn. Thomas again at the 2002 Olympics, this time on CB’s in GS. This picture is probably taken just coming on to the entrance of Gotcha Face, one of the photographers favorite spots to shoot. Once again, look at the outside shoulder actually turned ahead of his right hip. This is the lack of waist skills in at work. His waist is fairly bent and his tailbone is not tucked up and forward, as we will see later with Bode and later pictures of Thomas himself. What is most evident is that his uphill ski is well weighted and ready for an uphill ski release but his downhill ski is not finishing the turn aggressively enough which will undoubtedly cause him to be 1000ths to 100ths of a second off his mark for the optimal release point to the next turn, especially with a much steeper pitch just about to hit him. He does not have the ability to “steer” his outside ski independently of his tracking inside ski to stack over his engaged inside ski. Not bad, just not current. I know, we should be all this luc! ky right now, especially at these speeds. Okay, let’s fast forward with Thomas to the 2005 World Championships. He has since won two back-to-back GS races this year and finished wellin Slalom and yes, on Rossignol Skis! This is very hard to see and probably needs a computerized analysis program to really bring out the subtle angles, line and muscle involvement (we are working on this). In this picture Thomas is just entering the “carve phase of the turn right above the Apex”. Here is the fist evidence of what we all the “Twist” which short for all the goes into the waist steering theory (which is way more involved than we can get into on this forum, please keep this in mind). Simply notice that his torso is mostly square to the new turn and appears to be leading both his outside hip AND shoulder. What you can’t see clearly in this picture is that his inside hip IS stacked over the uphill ski and that the ski is carving right under his foot, this is very, very important to notice. As he continues through this turn he will be able to independently steer his outside ski while decreasing his radius of his inside ski as he skeletally stacks his weight to the uphi! ll inside edge right before his release to the new turn. The shape of the turn, as indicated by Tommy’s diagram, has been changed by the addition of waist skills that we simply did not see two years ago (thanks to Bode). Here is Bode at the World Championships. The first picture is in GS and the second below is SuperG. Let’s see what we can see. I believe that most people would look at this picture and cry “FOUL” saying he IS using hip angulation on this turn. Not so. We will look at a true “hip turn” a little late with Hermann. If one could rip off his shirt, peel off his layers of skin and see the muscles in his abdomen it would be clear that his waist is leading his outside hip and shoulder into this turn. Note once again that Bode has more weight stacked over the uphill ski and it is carving right under foot. How does he do this? Let’s go back to Tommy’s illustration of the vectors and line of center of mass by the Old School turn and the Twist (the waist skill turn). His center of mass is actually rotating towards his uphill ski radius allowing him to align skeletally over the outside edge of his inside ski but maintain subtle control of his outside ski for minute adjustments for terrain, conditions and line. He can only do this because his waist is CONTROLLING! where his momentum is headed and that is along the radius of the inside ski, not downhill towards the next turn – TOO EARLY. We all know that a ski turn is incredibly dynamic and that we are constantly adjusting millisecond by millisecond to the forces, terrain and the line we want to affect. It should be clear that the “Twist” does not continue forever in the same direction and that once it ceases to be necessary there may be other muscles at play that are equally as important. This is particularly true in those milliseconds from the finish of the last turn to the initiation of the next turn. It is in those critical milliseconds that photographers shoot many of their pictures that get people confused as to what they are actually seeing. In video, which is imminently more valuable to study, we can slow down the speed or even advance frame by frame to see all that is going on. I recommend everyone pull out their DVD’s of the 2002 Olympics! and whatever you have from this season. The changes will be sta rk, I promise you. What exactly is happening just before the release is beyond the scope of this article and of course will be fully addressed in our book. So be patient for now. So here is Bode making a SuperG turn. This is one of the clearest examples of waist skill and using the uphill ski I’ve seen to date. Look at how much “twist” he has towards the current turn. His waist is absolutely leading his outside shoulder and hip. His inside ski is absolutely skiing a shallower radius than his outside ski and he IS going to transition off that uphill ski to the next turn. IMHO. Fabulous shot and from my perspective says it all. I believe this is Karbon in GS. Women are built differently than men as they have wider hips relative to their feet placement. This creates certain optical illusions especially past the Apex of the turn. Look at her number on her bib. You can see her trying to utilize her waist but she doesn’t have enough skill yet to have the waist control her decent. Not to say she is not using her waist, she IS, just not to the degree that Bode, Benni or Thomas are. You can still see that the waist is barely leading her outside hip and that her hips are square to the turn. There IS NO COUNTER here. The tell-tale sign is the inside ski tracking while the outside ski makes a longer but more radical radius turn which is setting her up to stack over the inside ski and release off it. I could be wrong, but I’m not. And last but not least, everyone’s favorite, the Hermaanator. This is the old classic HIP Angulated turn. Only Hermaan can win using this today and that is only if Blowupde Bode blows up. I’ll just let you all look at this picture for a while and compare it to Tommy’s illustration, my comments and the pictures above. You tell me what you see as the differences.